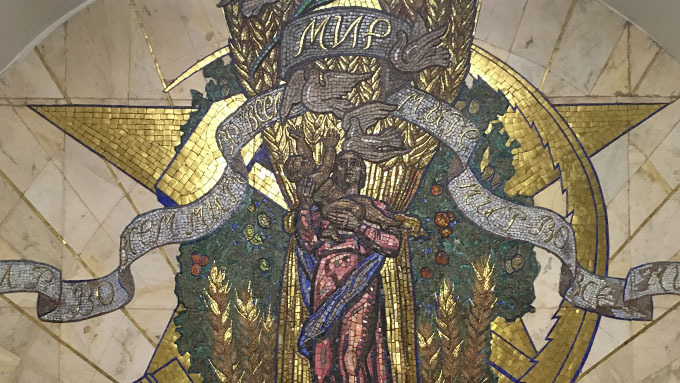 Fiona Burke, a double major in Russian and Philosophy, reflects after a month in Moscow. 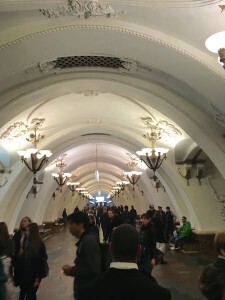 The Moscow metro is a great place to people watch. Through my incessant staring at people, I can confirm: Russians don’t smile – on the metro, on the street, in stores. I’ve been told that if you smile at strangers, they’ll think you’re either stupid or are maybe a friend whose face they’ve forgotten, or else just immediately recognize you as a foreigner. However, this isn’t because they’re cold. It’s because smiling or asking someone how they are aren’t just casual formalities as they are in America; they really mean something. When you ask a Russian how they are, they assume you really want to know the real answer, so you may get a long-winded reply about the repairs going on at their dacha, etc. If you speak even incredibly basic Russian you can tell that they’re very warm people, and it’s maybe because of this and their strong social networks and instinct to look out for one another that through all of their historical struggles they’ve stuck together and made it through. You can see this in small ways everyday. The other day I got a blister in some new shoes and was limping pathetically with my foot halfway out of my shoe, when a babushka (grandma) saw me struggling on the metro and offered me a band-aid. This past weekend I lost my phone in St. Petersburg and a stranger has gone to incredible lengths to hunt me down and get it back to me. One student from the university here heard me speaking English at a café and came up, introduced herself, and offered to help me practice Russian. And everyday in restaurants and stores, when I have to struggle my way through even basic transactions, almost everyone I encounter immediately realizes I’m a foreigner and speaks slowly to help me understand and pulls out one of their lovely, genuine Russian smiles to show that they appreciate my effort in spite of me butchering their language.